Well, I guess it's about time I reach into my box of treasures, pull out a comic, and discuss why and how it ended up in my collection. This time I've chosen by random, and what I pulled was a copy of Astonishing Tales #25. 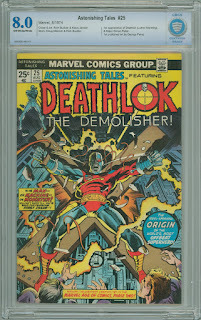 As most of you may know, this comic has the first appearance of Deathlok the Demolisher, and if you didn't know that, then now you do. This comic went on my radar when Deathlok was rumored to be appearing on the Agents of S.H.I.E.L.D T.V. show. I was hoping that this book would see a big boost in demand and value if or when the character would appear on the show. I can't remember what year that was, 2014 maybe? Purely a speculation buy. Anyway, my buddy Vic and I went up to Stockton Con, like we do every year, and one of the vendors that we frequent (Mike's Comics Plus) had a raw copy on his wall. I picked it up, scanned the cover for any major defects, and set it back down on the shelf. This is how I usually go about buying a comic at a convention. I look it over, put it back, then continue on through the con and either find something else I want to buy, or convince myself to snag the comic that I already looked at. Sometimes I do both. This was a case of trying to talk myself into the buy. I can't remember if I found any other books to buy that day, but I did make a point to head back to Mike's booth and see if I could haggle a price that I was happy with. I'd looked up the value in the latest Overstreet price guide while eating a healthy lunch of hot dogs and nachos, so I had a pretty good idea of what it was worth in the grade that I thought it might have been in. This was my first experience with Mike, and I believe that he had the book listed for $50. I had decided that I wasn't going to pay any more than $40 for it, so I made him the offer. Most vendors will usually take an offer of 10% lower than the price they have it listed for, but I was asking for 20% less. It was a gamble. He came back at me with $45 which was kind of expected, it was 10% off after all. I looked over the book once more, put it back sticking firmly to my $40 budget, and politely said, "That's a little more than I'm willing to pay" and started to walk away. I got about two or three steps away and I hear him say "Ok ok, $40". I turned around, handed over the cash, and put the comic in my trusty backpack. When I sent it in to CBCS, it came back at about the grade I had expected it to. It may have been a half a grade higher, so I really wasn't disappointed. However, I was really expecting to see this comic do more than it did in terms of value. I felt that this was an overlooked character and there was definitely some room for growth. 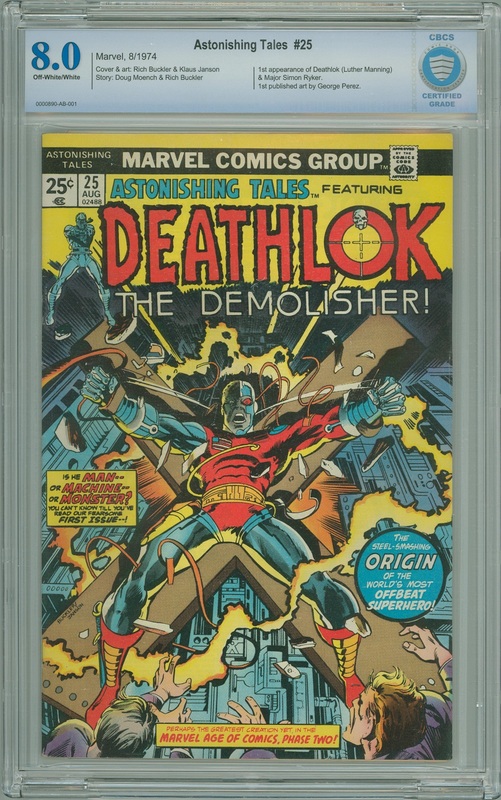 Even after it was confirmed that Deathlok was making his small screen appearance, this comic barely broke the $100 mark for 8.0 VF graded copies. 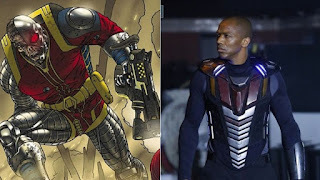 Could it be that nobody really cares about Deathlok, or was it because the Deathlok on Agents of S.H.I.E.L.D. looks absolutely nothing like he does in the comics? It could be either of those reasons or a dozen more. Who knows. So, now I have a copy sitting in my collection, waiting for any other news or appearances that may make this comic worth selling.